Was playing with the idea of a Graphic Novel about a Schooner Captain circa 1917. When I see it in this form, it sure has the feel of Popeye! I'll remove it in a bit. Yeah, the schooner captain is supposed to look a little like Paul. But I don't know now, illustration/graphic/comic-wise-- It's a lot of work! I'm learning at least some story boarding techniques which are good for thinking in terms of visual story telling: that is, for script writing. Good for a director of photography to know--different angles etc...Study the comics! I have a lot of respect for people who do this kind of artwork and make a living at it. I used to play around with cartoons, but just for fun. They have an amazing grasp of anatomy and perspective that impresses the hell out of me. They're still doing it---THe Old Way! I have a lot to learn of this art form. This was to see how I'd fare and to have a little fun playing with my story. It took about two days?? Yikes. Took these pics at an old Cemetary in Portland, Maine where my great great grandmother (1863) and a few ancestors are buried. I like the statues of the angels. I really liked the angel's expression. 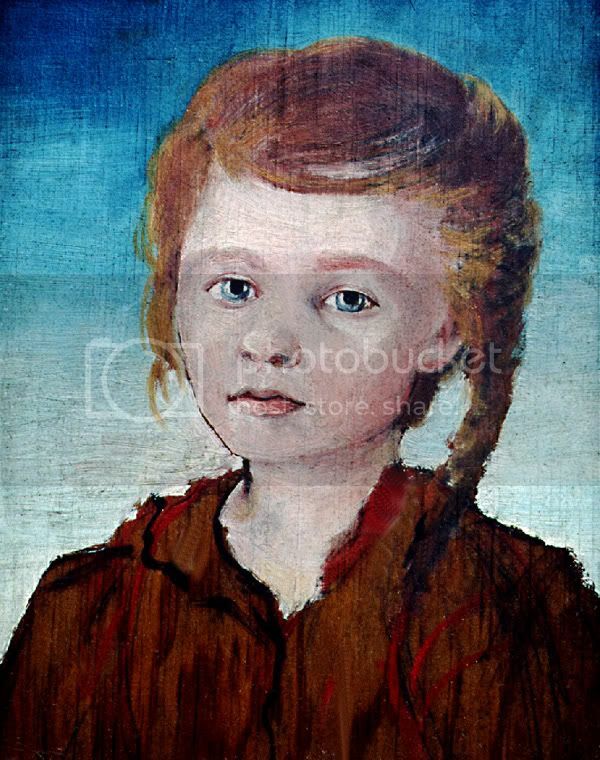 And this was a painting my Dad did of my sister when she was just a kid. I think turning "The Last Schoonerman" into a graphic novel is viable, and I like your trial efforts. The black and white photos of the angels are haunting, and your Dad's paintings are wonderful. He seemed to like atmospheric effects, too. Thank you very much for sharing these! Ohhhh don't remove it Maddy it looks great!!! I think a graphic novel is a fabulous idea.....hopefully, you'll have a chance to develop it. 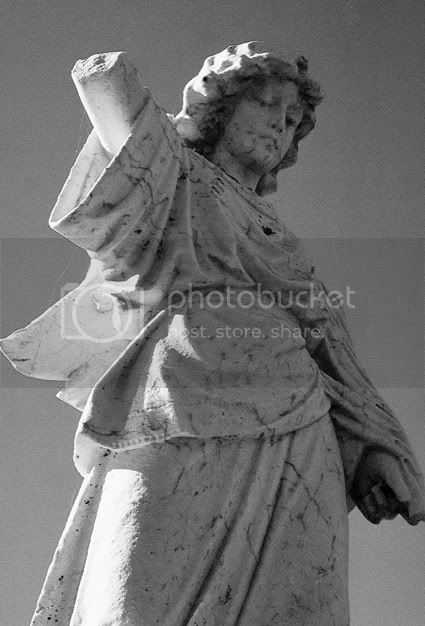 Your B&W angel photos are exquisite to look at(I think B&Ws capture so much more than colour photos) and so are your Dad's wonderful paintings!! That was supposed to say...The Down and Out. But I thought it a catchy phrase even though I messed up the type. Going to sea was the Last Refuge for The Daring, the Dastardly and the Down and Out. 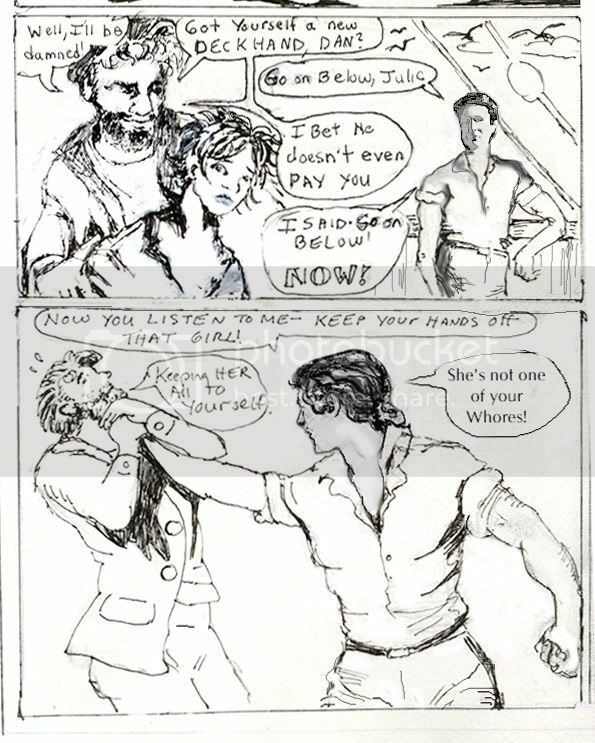 The girl, being the daring one, the here's rival boozing, womanizing captain being the dastardly and the hero, the Down and Out. There's some fantastic stuff out there in Graphic Novels, and in Comics. Many new movies are based on Graphic Novels. They're a lot of work, no easy ride there. In the old days, the process took several people. The penciller, the person who drew the type in the bubbles, the inker, the colorist...and so forth. People can probably use computers to generate artwork, but I'm hearing that artists are mostly still penciling it and inking it. Then, the scan it and color it on the computer. On this one, I inked over the original and really gunked it up. had to use white paint to cover them, and then go over and over mistakes with the ink, repeatedly. Never before tried my hand at drawing a likeness of of Paul before!!! Feels wierd....had to hide that part of the pic while my SO was snooping over my shoulder. Not that he'd mind if I drew him, but he'd probably think..."OH, she's spending all that time--on him again." And it was a lot of time. If he thinks it's just art, he's ok with it. I like the action figure drawings. That's fun. Must do better on anatomy bring in more interesting angles. And add in some KA-POWIES! WHAM! BANG!! A really good documentary was on the History Channel about the history of Superheroes, and in it, the history of comics through the decades. These people were so talented and creative. Though people used to frown upon comic book readers in yesteryears. Today, libraries embrace them, in the form of graphic novels as a means of connecting people with the written word. There are many reluctant readers (often they are teen boys who usually fall off the reading charts) and even adult readers--this might be the only thing they read. So, why the heck not embrace that form, if they're reading, that's great. Estelle--do everything in your power to keep Maddy from deleting any of that!! Maddy, it's fantastically interesting to see a work in progress like that! Please leave it--if you don't mind? Never before tried my hand at drawing a likeness of of Paul before!!! For a first try, you absolutely nailed him--even if it weren't a first try, I'd say you nailed him. Look at him him in that first 'scene'--he barely has half a face there, and it's completely obvious it's him. In the second one, as well--his body-type is absolutely right on--I would've known that was 'Lt. Bush' even if you hadn't said so. Maddy, I think you could do some really exciting stuff with that--I'm really looking forward to seeing what you come up with! As for your dad's work--oh my goodness Maddy--what talent he had! Flipping through quickly to the hay bales, I thought I was happening on a Van Gogh at first glance. 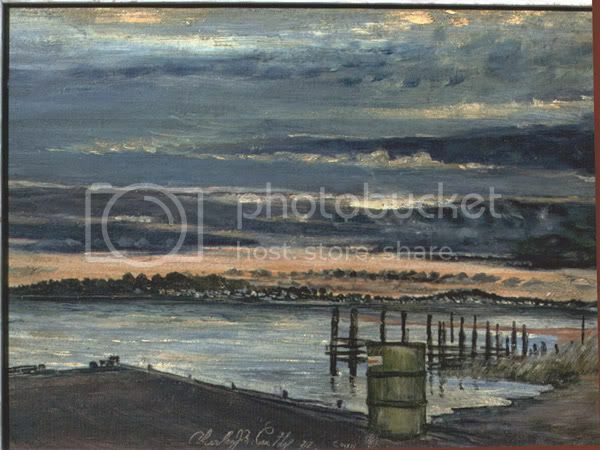 Your dad's style was slightly less expressionist and more realist, but it is just so beautiful. The picture of the sea is very atmospheric, and the portrait of your sister is wonderful and has a really nice primitive quality to it. (Is that done on wooden board, btw, as many primitives were?) Do you have these hanging in your home? Did your dad ever sell his work? Or was it strictly for pleasure? You are definitely your dad's daughter, after seeing the paintings you were working on in the Photo Album forum. Thanks so much for showing us all of this Maddy! Dup--don't even think about touchin' that delete button. Wow Maddy! Your dad was a fabulous artist. 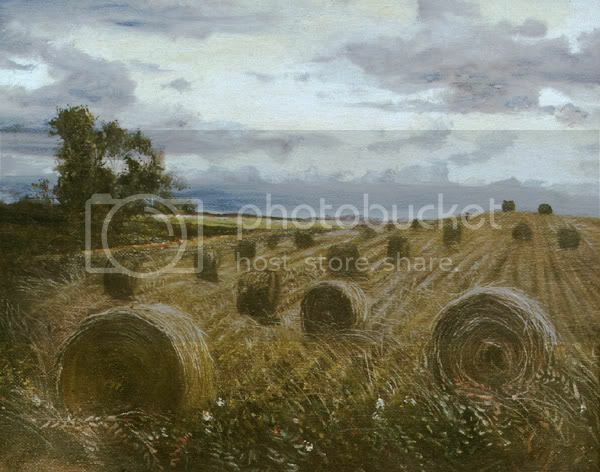 The bales of hay picture is amazing! Yes, that portrait was painted on wood. He painted on wood a lot, because it was available, couldn't afford canvas at the time, I think. A portrait he did of my Mom was done on the back of a window shade--at the time it was made of some kind of linen--but the grain of the material goes diagonally! And he was very much impressed by Van Gogh. In the early years he tried to sell his work, but he and my MOm had no idea how one "get's known" in the artworld. DUring the 60's and 70's Modern Art, Abstractism was the style most art dealers were interested in. Realism was unfashionable. My Mom and Dad were babes in the woods--with 5 kids! He was no salesman. Selling art is a business and you have to put on your business hat and leave the artist sensibilities at home. He just wanted to paint when he had the time. My Mom encouraged him to paint a few portraits of the presidents and a few famous people of their time. He mostly liked landsapes, though. He did one of Eisenhower, JFK and Jackie Kennedy, Churchill, Truman, Martin Luther King and this big collage of all these faces, people of "his day" called "In our day." THey did a big write up about it in the newspaper --during the Vietnamn War. And one time he was featured on a tv news feature, which was big in those days. The news article showed a photo of him in his dusty laborers clothes--with his cap, because it was taken --on the job, the construction site. Some exerpts from the article, the interview was taken on the job site he worked at, at the time. "Glance up sometime at the new windows at the end of the dining hall, you'll see dust, scaffolding and workmen. One of these workmen is...(my Dad) who does many things besides knock bricks out of walls." "He is modest. When asked about his art, he shook his head and pointed at the scaffold and said "That's all I do. It's all there." (He was overseas in WW2 for 4 years in the Pacific, so he knows what war is about. Many of his frames were slapped together strips of wood. "I haven't got all the fancy frames and stuff everybody likes around here. (Yale) I don't care at all about being known or famous or whatever. I mean, if I can make money by my job and still have enough spare time paint and sculpt, then I'm happy. I'm doing everything I want to do now and I'm having a good time doing it." Maybe the Eisenhower library or Kennedy's, or Martin Luther King libraries will come looking for those portraits someday, they always do after enough time passes. Till then, I am entrusted to keep the collection together. And that's quite a responsibility. Yes, that portrait was painted on wood. My son Patrick likes to paint on little squares of wood, but his style is abstract. In the early years he tried to sell his work, but he and my MOm had no idea how one "get's known" in the artworld. I don't think Patrick and his friends who possess BS degrees in studio art (that's right, bachelor of science degrees) from New York University know how to gain recognition in the art world. They all have interesting jobs that enable them to live in New York and they hold art shows from time to time. I figure they all need wealthy patrons to support their work. When Patrick was at NYU, he had some roommates who teased him about wanting to be an artist. So what were those guys aiming for after NYU? They were going to be Hollywood screenwriters. Thank you for including the article about your father's work. You have a marvelous heritage and are a fab artist in your own right. Thank you for sharing the article about your dad with us Maddy. It makes one wonder how many unrecognized talented people are out there living quiet lives and the masterpieces the world never gets to share. Wow, Maddy! You and your dad are both so talented!! I'm an artist too, and I love drawing people, but I could NEVER do a graphic novel. You're just brilliant! And with your script-writing skills, the graphic novel seems like the perfect medium to showcase your various talents! Go you! And those are great photographs too! 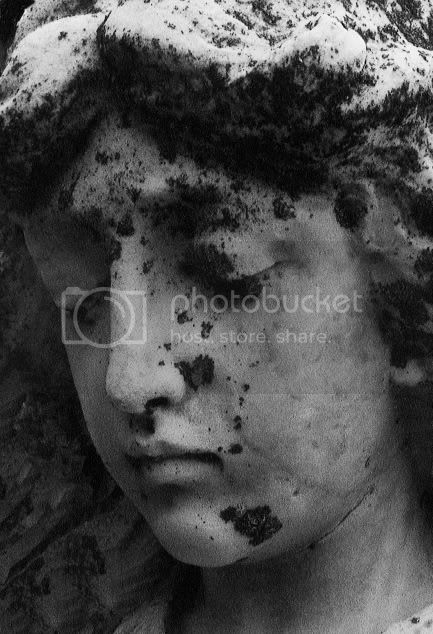 I took a photography class in college and also did a photo shoot at a cemetery. But with less impressive results! I like the dark sky behind the first statue. And I love your dad's paintings. I like the "primative" feel of your sister's portrait. (Primative in the art-historical sense, like the early American colonial period.) Except it's modern looking, of course, but it just has a simplicity and cleanness and honesty to it. It's not pretentious. And I love that it's painted on wood. Like that series they have on HBO, Entourage. They have less of a chance at hitting it big in Hollywood than an artist in New York. New York City is a good place to be, for the Art world. You never know, Patrick might meet and some patron of the arts might sponsor his work. I think his going to NYU was a good thing. He now administers the Rhizome.org site for the New Museum of Contemporary Art (see http://rhizome.org/). I wonder how the aspiring screenwriters are doing.